Publication Date: 1966 | Rating: 5-stars! A classic! An absolute masterpiece of true crime literature. Gritty and intelligent. This should be on everyone’s ‘books to read in a lifetime’ list. As many of you may know, In Cold Blood is the true account of the heinous murders of the Clutter Family in 1959 Kansas. In my opinion, the writing style of this account is absolutely flawless. Through Capote’s words, you are transported to this small town; you get alternating accounts from the family, from the killers, from other residents close to the crime. The account of the actual murders is bone-chilling and can disturb sleep, believe me! This is my second time reading this book and I found it just as impactful during my reread. 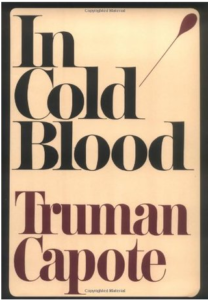 To me it is interesting to think about Capote compiling his research for this. He actually went and lived in this town, along with one of his closest friends, Harper Lee, and they painstakingly interviewed hundreds of people associated with the events. Just the sheer amount of data compiled and how it was intricately woven together fascinates me – yes, I know that is what nonfiction novelists do but this was a truly groundbreaking piece of journalistic writing at the time and should be appreciated as such. Another interesting aspect of this for me is how interested Capote was in the psychology behind the killers motivations and actions, as well as their complex relationship with one another both before and after the crimes. I think anyone who enjoys true crime, criminology, psychology and even sociology will find this book absolutely captivating. If you have been putting off reading this for any reason, please stop, read this…now!